The Nazi's plans to rid Nazi-controlled Europe of the Jewish people through the genocide of 'The Final Solution' are well known, and are justly condemned by all right-thinking folk around the world. What are less well-known are the similar plans to segregate, persecute, and in the end annihilate the hundreds of people in Europe who we would call (often innocently, though sometimes pejoratively) 'Gypsies'. It is believed from linguistic and genetic evidence that the Romani people originated in northern India and embarked on a diaspora about 1,500 years ago. The European Romanies migrated through the Balkans at least 900 years ago, when mediaeval accounts of their persecution immediately began appearing in the records. Across Europe they were either put to death or expelled, or branded with hot irons. There are accounts of Romani women having their ears cut off, or their children abducted. The Romani language was everywhere banned, and in some countries Romani people were forbidden to marry amongst themselves. In a feudal society where everyone was bound life-long to the land and the lords and owners of that land, an itinerant folk who refused to remain in place was considered a threat to the 'natural order' of the world. The Jews faced a similar problem, though their propensity to assimilate into society, and even renounce their religion - the core of their identity - meant that by the turn of the twentieth century many Jews had prospered and gained high status in European society. Not so the Romanies, who continued to be shamelessly persecuted right up until the start of the Nazi regime. Both Jews and the Romani were then subject to the most horrific consequences of National Socialist ideas for the regeneration of Europe through 'racial' purification. Under National Socialism the Romani people were the first to be interred in concentration camps, to be forcibly sterilised, to be used as guinea pigs for extermination through gassing. Thousands ended their lives in the SS-designated 'Gypsy Camp' of Auschwitz-Birkenau. By the end of World War II an estimated 500,000 Romani men, women and children became victims of the Nazi genocide program. Berlin had built a vast, impressive, and moving Memorial to the Murdered Jews of Europe, inaugurated in 2005. People rightly asked, well what about the other murdered groups of Europe? What about the Romani folk for example? Or the homosexuals, the mentally ill, the Jehovah's Witnesses and other pacifist groups? 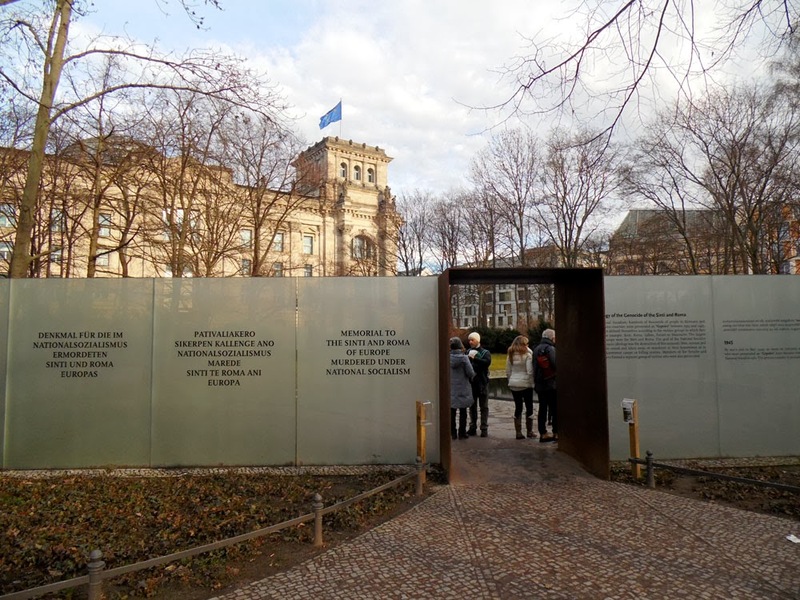 In May 2008 Berlin erected a memorial to the homosexuals persecuted under Nazism. 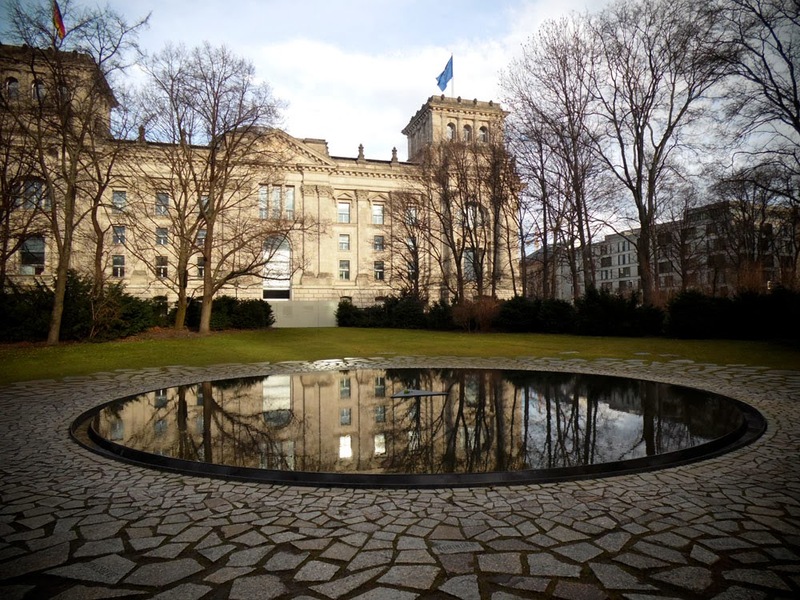 Good and proper, but it wasn't until 24th October 2012 that Chancellor Angela Merkel officially opened the 'Memorial to the Sinti and Roma victims of National Socialism'. By the way, in German-speaking lands, the Romani people were called 'Sinti'. In Eastern Europe and Russia they are called Roma. In their own dialect, they refer to themselves as Romane. 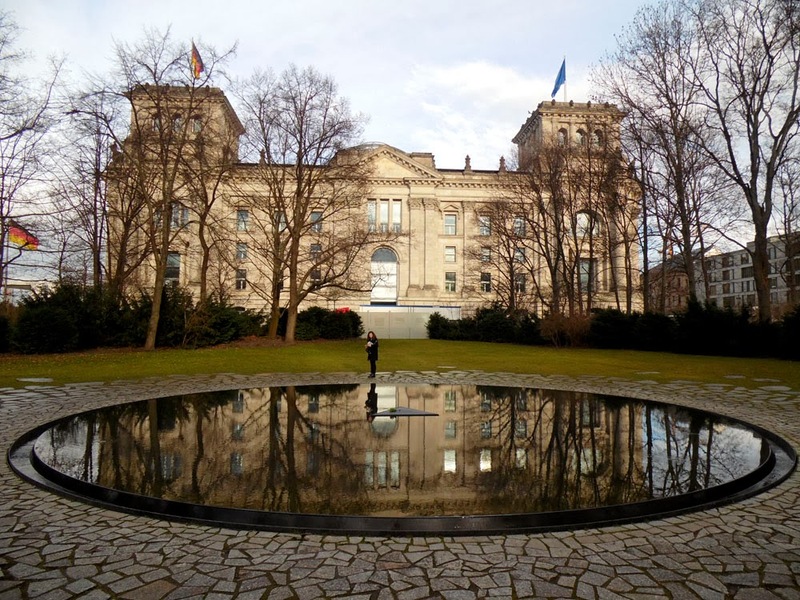 "A clearing in the Tiergarten, lined with trees and shrubs, in the vicinity of the Reichstag building. A quaint, unimposing site, withdrawn from the bustle of the city. A site of inner sadness, a site for feeling pain, for remembering and not letting the annihilation of the Sinti and Roma by the National Socialist regime fall into oblivion. Is such a place possible? Or is it only found in emptiness, in nothingness? Do I have the strength to create a site of nothingness? A site deprived of everything. No words, no names, no metal, no stone. Only tears, only water, surrounded by the survivors, by those who remember what happened, by those who know the horror as well as those who never experienced it. They are reflected, upside down, in the water of the deep, black pit, covered by the sky – the water, the tears. Only a small stone, which sinks and rises, again and again, day after day. And on it every day a new blossom, so that each day we can remember anew, constantly, to all eternity. The water encloses the sky, the blue, the grey, the black sky. Clouds, light, darkness. The whirling water swallows it all. All that remains is the sound of a lonely violin raising a murdered melody, poised in pain." 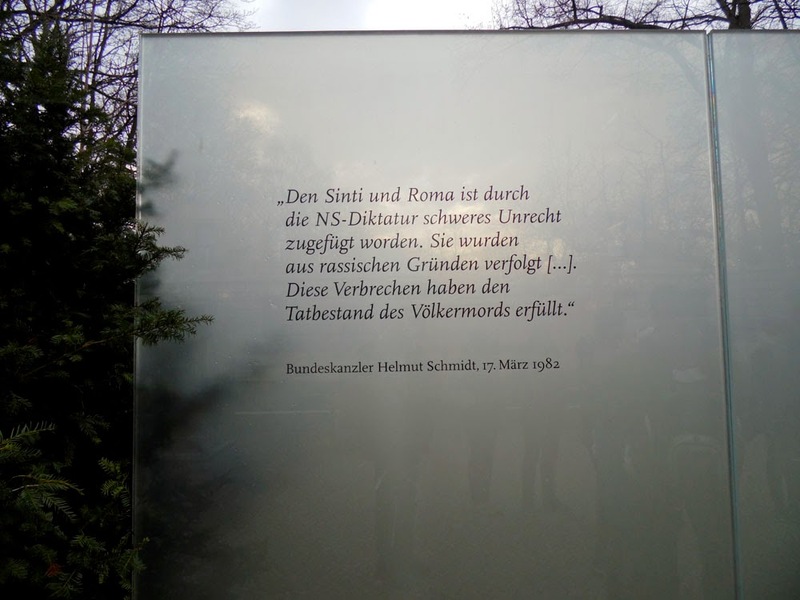 In the explanatory boards that surround and shelters the memorial are the words of German Chancellor Helmut Schmidt (photographed above) that confirm that the injustice inflicted on the Romani constituted genocide. In the centre of the mirror-like pool is a black, stone triangle. We all know about the pink triangle badge that homosexuals were made to wear in the concentration camps. The Romani people were similarly often made to wear a black triangle badge, which designated the prisoners who were 'asocial'. Others made to wear the black triangle were the mentally ill, the homeless, alcoholics, the 'work-shy', and draft-dodgers and pacifists. Each day the triangle descends into the pool and comes up with a fresh flower.